Forget the rivalry Between Boeing's 787 and Airbus's A350. Competition in single-aisle jets is taking off. FORTUNE -- The battle over commercial aircraft is turning into a captivating global brawl. Manufacturers Bombardier (Canada), Bombardier (Brazil), and Mitsubishi (Japan) are all working on new single-aisle or regional jets. Why now? Big planes have gotten most of the headlines, but smaller jets are set to do the most flying during the next two decades. Airlines continue to rely on narrow-body jets -- or planes with two or three seats on each side of the aisle -- for many routes. 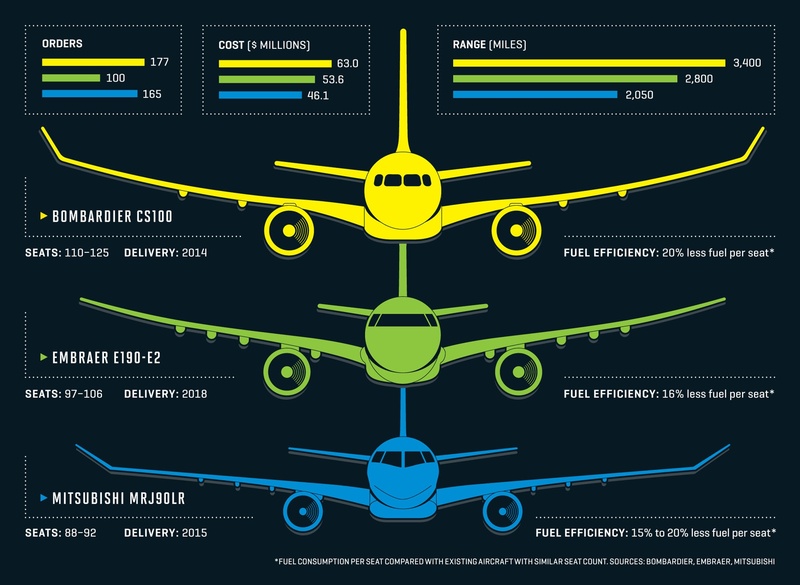 The number of single-aisle jets in service is expected to double by 2032, encompassing 70% of all commercial planes. The expansion will be worth nearly $2.3 trillion in new sales, analysts estimate. Boeing and Airbus still dominate, but smaller manufacturers see an opportunity in the duopoly's preoccupation with larger aircraft. Bombardier is fielding the CSeries, a slightly larger plane than its current jets. "Boeing and Airbus -- they have other priorities," says CEO Pierre Beaudoin. "We feel that the segment of 100 to 149 seats is a category that they're abandoning." Embraer's E2 craft, meanwhile, is essentially an upgrade of the company's current line. The Brazilian firm hopes a new engine and new wings will goad airlines into giving the plane a second look. Mitsubishi, which has spent years making parts for other manufacturers, now plans to sell fully assembled planes itself. Its MRJ is the first jet made by the Japanese since the early 1970s. Still, setbacks are routine in aviation. The Bombardier CSeries' first flight was delayed, creating concern that the plane would miss its expected service date next year. So far, sales haven't been stellar either. Bombardier failed to add to its order book at the recent Paris Air Show, for example. (Sales could spike once the plane proves itself in the air.) Mitsubishi also has its work cut out for it. "Most startup airplane companies fail," explains former Boeing research engineer and current Bank of America aerospace analyst Ron Epstein. "Mitsubishi has deep pockets and a big company and all that, but there are issues: certification, weight, performance ..." In other words, it may be a bumpy takeoff.